We have wild plum trees growing all along the creek. Most years we go out and pick a heap of them, but because we had a severe late frost, we have no plums this year. I was disappointed because I had planned to have a go at making plum paste to have with cheese platters over the coming months. 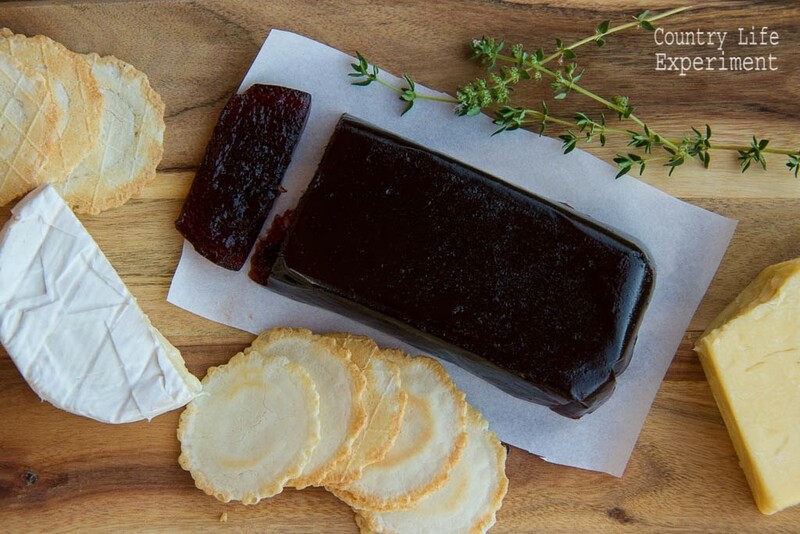 I’ve been a big fan of plum paste on a cracker with a bit of cheese for a while now. I tried some of Maggie Beers’ and was hooked. I’d tried her fig paste, and quince paste too, but the plum paste is my favourite. Luckily for me, my mother in law wandered down with a large bag of plums for me that she had picked at my Brother in laws house. I knew exactly what I was going to do with them! Wash the plums thoroughly, and remove any stems. Place in a large saucepan and heat gently until the plums collapse. Remove the stones. To do this I pour the whole saucepan through a sieve which drains the liquid and makes it easier to see the stones. I then remove the stones with a teaspoon, and return the remains (including the skins) to the sauce pan. You should be left with 850g of plum flesh. Use a stab blender to purée the mixture. Alternatively you could put the whole mixture into a food processor. Add the sugar, lemon juice, nutmeg, and cloves to the plum purée (how much sugar depends on how much plum puree you have - use an equal amount of sugar to plum purée). Gently boil the mixture, stirring regularly until the mixture resembles runny apple sauce. You can check whether it is ready by dropping a small amount onto a cold plate. It should set firmly. Pour into a silicone mould, or a tray lined with baking paper and allow to set. This amount will fill a lamington tin. Alternatively you can fill several smaller tins (which is what I did). Once set, wrap in baking paper and store in an air tight container until it is needed. Use a hot knife to cut into portions as needed. My only comment is that it’s very sweet – can this work successfully with less sugar or would it not set properly? Hi Jo, thanks for a great recipe – I’ve heaps of plums and now I can do something different but yummy with them. Can I use a small amount of pectin as the setting agent in this recipe? Absolutely! If you’re a bit nervous about it setting, pectin (or jam setter as it is sometimes known) will definitely help. Generally for me, I haven’t needed it, but it won’t hurt! Enjoy! This is my second year making this as Christmas gifts. 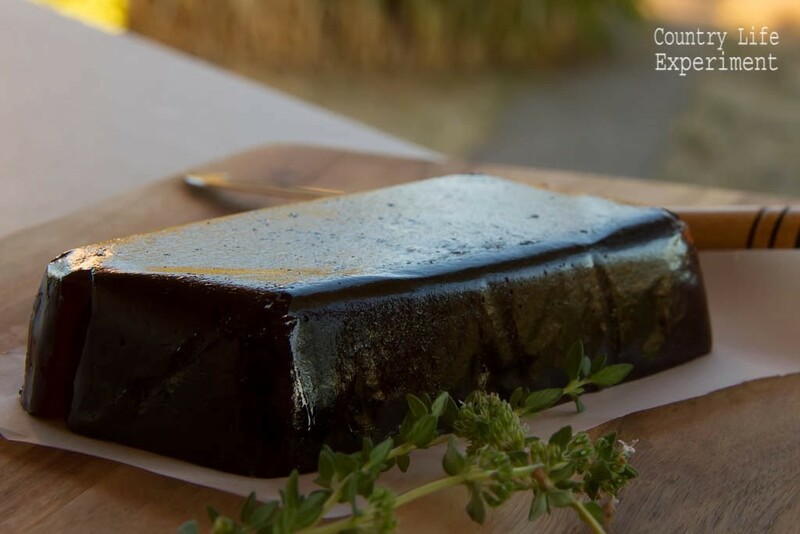 It’s a huge hit and much easier then baking and suitable for the summer cheese plates we have this time of year in Australia. My question is storage. Shelf or fridge and for how long. I would think the high sugar content and no dairy would mean at least a month on the shelf. Thoughts? I have kept it for 6months in an airtight container. I tend to pour mine into small jars these days and then seal like jam. Hi Susan, the amount of time needed to boil the mixture really depends on a number of things. If the mixture is quite watery it will take longer than if it is thick. Sometimes it has taken an hour or two, while other times it has only been about 30 minutes. The final consistency is the most important thing. It really must be like puree apple. Test it on a cold plate. If you find that the mixture is runny or sticky, you can always boil it some more, and add some jam setter (pectin). 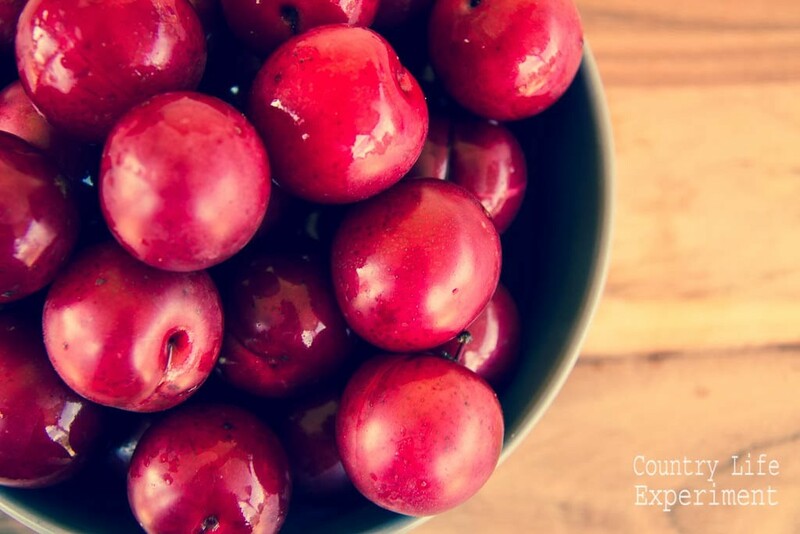 It shouldn’t need pectin (there is plenty in the plums), but if you’re nervous it can give you peace of mind! Let me know how you go! Hi Sunshine, I don’t add water, but it won’t hurt the paste, it will just take a little longer to set. Enjoy! Fruit pastes are not available here in Bahrain….I made your recipe and have revolutionized the cheese platters everywhere I go! Thanks! Hey there, I made this recipe as per the instructions and added more sugar to the amount of puree I had. It is still not set to the correct constancy. What would you reccommend I do? Boil it a little longer is the best thing to do. If you’re nervous that it won’t set you could add some jam setter ( also known as pectin) but if you uses ripe plums it should just need to boil longer. Wondering if you may have any chestnut recipes?? Thank You Jo! Really enjoying the paste and keen to give other fruits ago!! Hoping that feijoas and persimmons will go a treat as pastes since these fruits are plentiful for me when in season. What are your thoughts?? I made this recently and it turned out very sticky, like toffee. Did I boil too long? not long enough? or too much sugar? The taste is wonderful though. Boil a bit longer until it sets fully. what happenes to the whole cloves, do they just get minced as well or do you remove them? Fabulous! My daughter put me onto your recipe and after 2 batches I’ m ready to experiment with other fruits. THANKS! No prob. I’ve also made a pear and ginger paste, and I would love to have a go at quince paste. A friend just asked me a few days ago what she could do with all her plums…I will be directing here to that recipe! Thanks! Hope she enjoys it! Well that just looks yum! I will be trying this when plum season hits here! The list of fruit trees to plant out at the farm is getting longer and longer everyday. Plum tree STAT!! Enjoy the cheese. I have lots of wine if you need a bevie to match! !